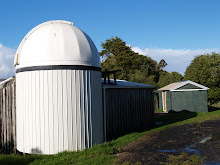 Kumeu Observatory Log: Network and weather station problems fixed. Fixed the network connection to from the Dome to Steves house, 200 meters away. The post on which a repeater was on had been removed! A few screws and cable ties and its fixed. Also the remote sensor for the external wind vane and rain gauge stopped talking wirelessly to the inside unit. Ran a wire between the two, seems to be working fine now. Manual says this will reduce battery life so have to watch that.